Searching the net we have found the instructions for making a nice side table that can also be used as a box, obviously is completely made ​​from pallets. We like specially this side table due to the many different features that it offers, it can also be used to store clothes, firewood, toys, as a bedside table or even to drink a vermouth! As you can see in the first image of the post, also can be used as a stand to put over it a plant. 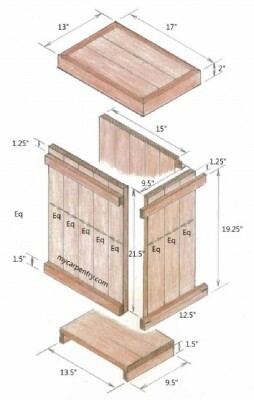 You’ll find the instructions to make it at: Mycarpentry.com, where they illustrate you of the whole process of the development without any difficulty. However, the original use of it was to be a bin. Prepare your tools and get ready to work! Do you like this DIY pallet side table? Do you want to look for more DIY pallet tables?